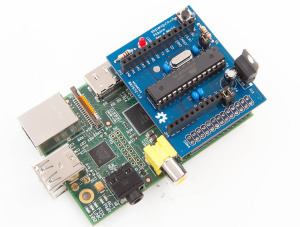 I got the idea from seeing Dave Whale’s serial based Arduino interface with the Pi. The Trinket doesn’t have serial so I had to use something else to talk to it. Enter I²C; on the Trinket side I’m using the TinyWireS library, on the Pi side I’m calling smBus.writeList() with a list of the bytes I wish to send. You’ll notice in the video there’s an extra breakout in the circuit, this is a bi-directional level converter to allow the 5v Trinket to talk to the 3.3v Pi without releasing any magic smoke. My aim is to implement the commands in the Neopixel library however at the moment it just calls setPixelColor with the 4 values (LED, Red, Green, Blue) provided by the Pi. I have a special case of LED==0xFF which lights all LEDs the specified colour (a concept I have pinched from David). I have included the code below in it’s current (probably hacky) state. This entry was posted in Arduino, NeoPixel, Projects, Raspberry Pi, Trinket on July 18, 2014 by ForToffee. I have always programmed in VB (5, 6, .NET even VBA! ), I’m also starting to look at C# again after a brief dalliance 5 years ago, and of course I have a passable knowledge of Python from working with the Raspberry Pi. Ever since picking up and playing with the Pi I have become aware of these Arduino thingies. What really peaked my interest were the wearables like GEMMA and FLORA and the work of Charlotte Godley. They’re small, uncomplicated (in theory) devices to hack about on fairly easily. 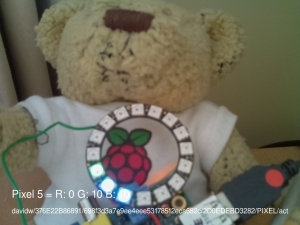 Fast forward to the beginning of the month at the July CamJam and I was enticed by The PiHut and their wares, eventually crumbling and buying an Adafruit Trinket along with a NeoPixel ring (mmmm 16 LEDs!). After getting the IDE and drivers setup (more on that later) I loaded the obligatory blink sketch, which is the Arduino equivalent of ‘hello world’. Flushed with success (or something like that) I moved on to the NeoPixel ring, wired it up and loaded the Larson Scanner sample. 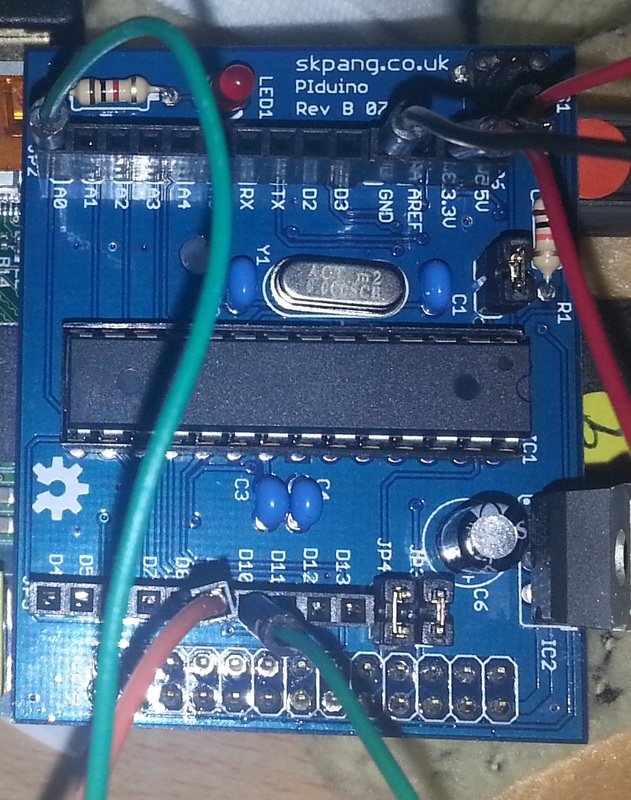 It needed a couple of tweaks; namely the data pin and the number of pixels, but it worked very well. 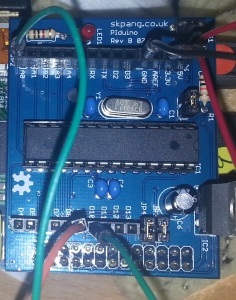 Ultimately it was time to write my first ever bit of Arduino (or C for that matter) code, cribbing from and building on the examples I had come across thus far. The USB is temperamental – After much faffing and cursing I discovered in the Adafruit FAQ about reducing the chip_erase_delay. This made things much happier on my laptop! Commands in C must end with ‘;’ – Obvious I know but the number of times I forgot! For loops work differently – I’m used to a For … Until construct (i.e. For n = 0 to 15 or for n in range(0 to 16)). It took me ages to work out why my for (n= 15; p=0; p--) didn’t work correctly! Debugging is hard – The Trinket has no serial console so you can’t see what the code is doing. To resolve one issue I ended up downloading Tiny C Complier (TCC) and creating test code to see what I was doing wrong. For reference a uint_8 of 0 minus 1 is 255 not -1 because it’s unsigned – doh! All in all it’s been a very fun learning curve and I’m looking forward to trying out a few more AdaFruit examples. Oh wait, what’s that in the next article? 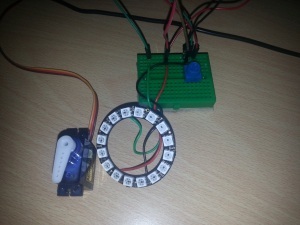 This entry was posted in Arduino, NeoPixel, Trinket on July 18, 2014 by ForToffee.